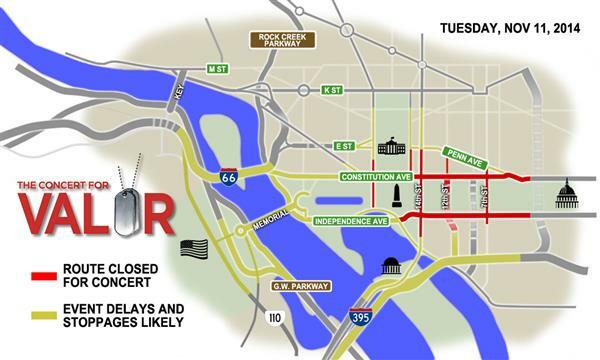 WASHINGTON -- The National Park Service is urging drivers to prepare for road closures around the National Mall this Veterans Day for HBO's Concert for Valor. Although the concert will be an evening affair, roads will be closed all day in preparation for big crowds. Beginning around 6 a.m., police will block most of Constitution and Independence avenues and the numbered streets that cross the Mall, including busy 14th Street. Delays could also result from motorcades destined for the various ceremonies planned near the downtown memorials. Metro will offer enhanced service in the hours leading up to the concert by adding extra Yellow Line trains. Blue Line trains, however, will run less frequently. The Smithsonian station will be closed for security reasons. All other Metro stations will be open.